Find scary Halloween haunted houses in Tennessee at the Funtober directory of haunted attractions for 2018. A complete list of all the local Tennessee haunts including haunted houses, haunted hayrides, haunted trails, scream parks and more. Enjoy an evening out with your friends at a haunted house for the scream of your life. 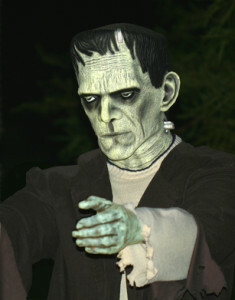 Find Hollywood set designs, live actors, air blasters, creepy costumes, amazing animatronics, and thrilling costumes. Season begins this year on September 28th. “Warning the woods has been infected”. Bloody Acres has 14 acres of blood and gore on wooded trails with various rooms and scenes of screams. Tickets are $15. The haunt is open Fridays and Saturdays from 7 pm to 1 pm in September and October plus 7 pm to 11 pm on Sundays in October and weeknights during Halloween week. Sorry folks but this attraction has permanently closed. Opening night is September 15th. This is Nashville’s most controversial and scariest haunted house. “A Night in Hell” with lots of blood, screams, and zombies everywhere. Tickets are $20. Devil’s Dungeon opens Friday and Saturday in September and Friday, Saturday, and Sunday nights in October. Open from 8:00 pm until 1:00 am or 7:00 pm to 10:00 pm on other nights. Check website for additional dates. The cursed town of Dread Hollow opens September 28th, running Thursday – Sunday nights throughout October and Halloween night. 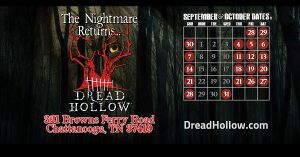 Created by the masterminds of nationally-ranked Ruby Falls Haunted Cavern, Dread Hollow is one of the most horrifyingly innovative in the nation and was named a must-see haunt in the Southeast. There is nowhere to hide from the sinister darkness of three haunts combined in one terrifying nightmare. Due to the intensity of this haunt, it is not recommended for children under the age of 12. The fright begins on September 29th. The four haunted attractions at Frightmare Manor are Manor, Backwoods, Night Harvest, and Phobia. A single ticket at $28 gets you into all 4 attractions. The Manor features the main haunted house of a former serial killer Jermiah Lexer. Finally ask the owners about The Challenge. They are open every Friday and Saturday night in October plus additional dates. Located on the abandoned Jeremiah Lexer plantation, Frightmare Manor spans 20 acres, offers 3 independent, walk thru, Haunted Attractions on site, boasts a heart-pounding Free-Fall Attraction unlike anything you’ve ever seen in the “Lexer Jump”, and features the Nationally Recognized Nightmare at Frightmare Challenge. If all Walk-Thru Attractions are successfully completed, you WILL get your $45 back. You’ve been warned – TRUE TERROR EXISTS HERE. Near Knoxville is this 13,000 square feet haunt dedicated to making you scream. Expect some undead creatures and dark entities at this great scare. They have good actors and great scenes. The theme is “Some Things Should Remain Forgotten”. They are open every Friday, Saturday and Sunday nights in October beginning September 29th. Check web page for additional dates near Halloween. Doors open at 7 pm. Mysterious Mansion is open now. An annual event that’s been frightening people for over 30 years. Open weekends for special Halloween show until 11 pm. Tickets are $14-15. This attraction is open all year and open 7 days a week from spring break through October. Opens for the season on October 5th. Dark Web and Hackers Asylum are but two of the 5 haunt attractions at this place. Tickets are $20-25. They are open Friday, Saturday and Sunday nights in October. Over the years they have received a number of fan and fright awards. Check their webpage for details. New location at 2665 South Perkins in Memphis in the Trolley Station Shopping Plaza. The two haunted attractions at Mid-South are a haunted maze and a separate haunted hayride. This is a working farm with other corn maze and children’s activities going on during the day. At night you travel through the scary maze and the hayride. They are open nights until 10pm. The dates start on middle of September for daytime activities and September 29th for the haunt attractions. They also have a jumping pillow, and corn cannon shooting area. Haunt is open every Friday and Saturday plus Halloween in October. Opening night is Sepember 21st. Two haunted houses feature dark passages, wandering monsters, state of the art animatronics, an incredible special effects. Starts Tickets to Nashville Nightmare are for entry into their 4 major haunted houses. Night Terrors has 13 different scenes such as the all new Madison Square Mortuary, Harpo’s House of Horrors, Big Mamas Meat Packing Plant, Cellar Dwellers, and Underwood Asylum as examples. The separate all new haunt Horror High is based on high school. Your school was never like this. Where are all the people? It takes about 40 minutes to go through Night Terrors and 20 minutes for Horror High. Nashville Nightmare is open 8pm to midnight on most weekend dates. Sunday nights are 7:30 pm to 10:30 pm. It runs every Friday and Saturday nights in October plus most weekdays and Sundays around Halloween. Haunt ends November 10th. Opens for the season on October 5th. Doors are open 7 pm until 11 pm. Jones Orchard also runs a farmers market until 6 pm and then continues with a corn maze, pumpkin patch, and hayrides. Haunt attraction runs Friday, Saturday, and Sunday nights in October. Open in 2018 from 7-11pm on October 13, 19, 20, 26, and 27. Adults are $15, and children 12 and under are $10. The season begins on October 5th. “Chattanooga’s Best Haunted Attraction” describes the Haunted Barn. Now with 20 years experience they have constructed a huge maze and 16 rooms throughout the barn. Expect to see a few monsters of unknown fright and description. Tickets are $20. Gates open at 7 pm. The Haunted Barn is open every Friday and Saturday night in October. Doors close at midnight. This is a fun place with a huge bonfire, dance, live dj entertainment, great concession food and lots more fun. Opening night is September 28th. All new attractions with extreme gore and fright this year. Maybe the largest indoor haunt in the Midsouth. It has zombies, ghosts, psycho clowns, and lots more scares. It runs from 7:00 pm until 12:00 am. Open Friday, Saturday, and most Sunday nights plus a couple more dates. For 2018 you will experience The ALL NEW MASSIVE Underground Military Bio-hazard Research Laboratories. Go Deep Underground to these Military Research Labs as they hold some of the Worst Infectious Diseases on Earth,” Small Pox, Ebola, The Plague, Leprosy, Malaria, Influenza, Yellow Fever, Anthrax, and SARS”. BUT Something has gone Deathly wrong. Wow. Tennessee borders a lot of states. Perhaps one of them has a closer haunted house than the above options in Tennessee? Have you experienced one of these haunted houses? Future visitors would be interested in hearing what you thought. Did you have fun? Was it worth the money? Would you suggest it to our readers? Any suggestions to maximize your experience? I’ll gladly publish what you send me and give you a virtual hug. Thanks for adding our site. We will be open this year between Oct. 1st and Oct. 31st, opening each night at 7:30pm. You can see our website for full info on open dates and times. Located at 9567 Hwy 11E, Lenoir City TN 37772. Our info line is 865-288-7344. Ticket prices at $16.95 plus tax. Fast Passes are also available at the ticket booth or on our website. 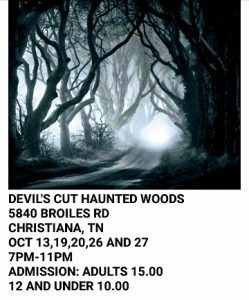 Come SCREAM at one of the Largest, Most Original, and Scariest Haunted Houses in the Knoxville Area of East TN! We are a HIGH energy, HIGH intensity, INSANITY DRIVEN Haunted House Attraction! Set on a real farm in East TN, psychologically designed to shock your senses, test your limits, and bring out your deepest fears! In addition, we’re the ONLY regional Haunted Attraction that is confirmed ACTUALLY HAUNTED! In addition to the haunted house there is a full midway of fun with bonfires, concessions, side shows, and performances.